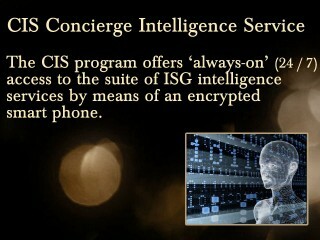 The CIS program offers ‘always-on’ (24/7) access to the suite of ISG intelligence services by means of an encrypted smart phone. In addition to secure communications, pushed alerts and rapid responses to your intelligence requests, your cyber network and RF environments are analyzed 24/7 for any variances that may suggest a breach. This will allow you to be in control of your communications and environment from eavesdropping. Managing your personal, family and corporate security plan is one of the most important decisions you will ever make and the CIS program allows you to participate in these services on a subscription basis. KryptAll Secure Cellular Phone A modified cellular smart phone with industry standard AES 256 encryption, employing an encrypted key, operating on a secure server network. Provides the user with the ability to make secure encrypted calls to regular phones without producing call records. 24/7 CIS Application 24/7 real time service accessed via a smart phone application providing service requests and information for intelligence, security, travel intelligence, briefings and alerts. RF Cyborg Automatic Radio Frequency (RF) survey module that continually “sweeps “specific areas for RF eavesdropping devices and reports back to ISG for further analysis. IT Cyborg Automatic survey module that continually “sweeps” your network for IT attacks while conducting penetration testing and reports back to ISG for further analysis. Crisis Management Survey Survey conducted for Principal client andfamily with up to 4 members included. Digital Reputation SurveyDigital Assignation Daily search engines survey for up to five identities. Personnel / Staff Evaluation Background check and evaluation included for up to two subjects. Training Seminars Various seminars are made available to the principal throughout the year covering such subjects as: Truth & Deception/Body Language, Foreign Travel and Survival, Defensive Driving, Self Defense and Protection Tactics, etc. Intelligence Consulting Services are available to include: Background Checks, Asset Verification, Location Services,Foreign & Local Hierarchy Evaluation. NOTES: (A): Up to 15,000 square feet. Additional square footage priced on request. (B): Business class travel, transportation and lodging for technicians is additional. (C): Principal receives discounted rates.